The TAP® (Thornton Adjustable Positioner) is based on the same principle as that of cardiopulmonary resuscitation (CPR). The airway must be opened to allow air to pass through the throat. A constricted or collapsed airway causes snoring or sleep apnea. The TAP anti-snoring device holds the lower jaw in a forward position so that it does not fall open during the night and cause the airway to collapse. It maintains a clear airway to reduce snoring and improve breathing. 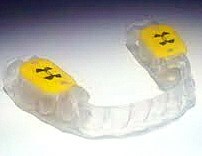 The TAP anti-snoring device is comfortable and custom-made to prevent any change in teeth position or mouth structure. It is patient-adjustable, allowing for maximum comfort and effectiveness. If you or someone you know experiences severe tooth, jaw or facial muscle pain, it may be from the effects of grinding or clenching your teeth. The good news is your dentist may be able to prescribe a custom-made Comfort H/S Bite Splint™, which offsets the pain caused by bruxing or grinding your teeth. 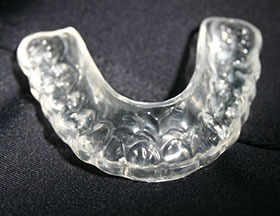 A nightguard is a proactive step to protect your existing healthy teeth. 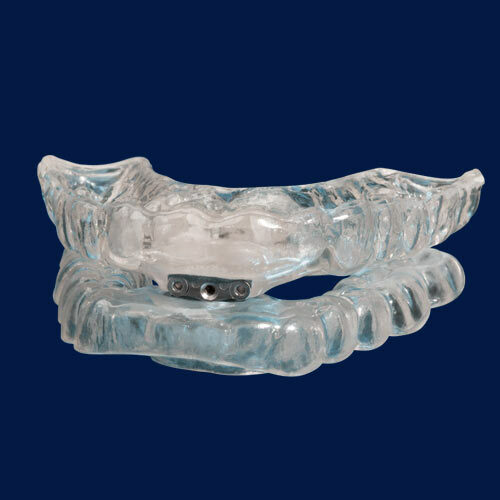 A clear, thin removable device, your custom-made bite splint is worn over your lower or upper teeth as you sleep. When you train and compete, your natural reaction is to clench your jaw. It's part of the "fight or flight" wiring of your brain. Your clenched jaw and teeth compress your temporomandibular joint (TMJ), triggering the release of excess amounts of performance-sapping hormones (like cortisol) that produce stress, fatigue and distraction. Under Armour Performance Mouthwear prevents your teeth from clenching and pivots your jaw forward to relieve the pressure on the TMJ. Increasing strength and endurance, speeding up reaction time, and reducing stress. PlaySafe is the most prescribed mouthguard in the U.S., Europe and Australia. Customized to fit your mouth, statistics show that when worn properly, a protective mouthpiece decreases the risk of injury by 99 percent.